The kids and I have our Bible Time in the morning at the kitchen table while they eat breakfast. It’s the way we begin our homeschool day. We continued our discussion on Gentleness throughout the week last week. I found this neat idea which really drove the point home. It came from an excerpt a friend had torn from the Aug./Sept 2011, Focus on the Family Magazine. I held up a balloon and a wooden skewer and had my son try to get the skewer through the balloon. Of course he stabbed it and it popped. 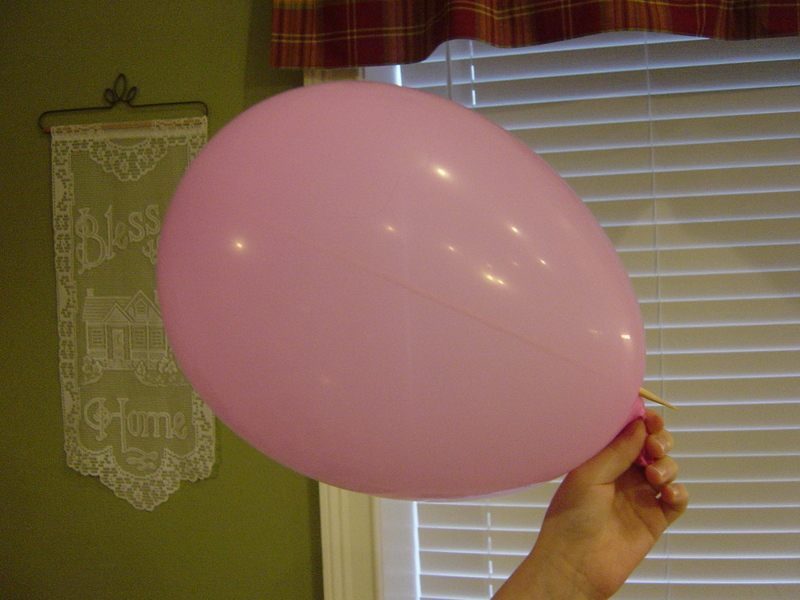 I then took another balloon that had already been blown up (not too tight…you should be able to poke a finger inward pretty easily). I had rubbed dish detergent on a wooden skewer in advance. I gently rotated the skewer and pushed it through the balloon starting at the end at the top that has the darker colored spot…and ending on the bottom end, just beside the knot. We discussed that when we use force to get what we want, it just doesn’t work so well! In fact, we usually wind up with a mess! When we are gentle, we can get things done. We brainstormed ways to apply the scripture. For example, when your sister has your toy, what could you do/say to show gentleness verses yelling and snatching the toy back. Be sure to check out my Youtube Channel for videos on How to Use the Bible to Teach a Sunday School lesson (verses just reading the lesson). Thanks for visiting my blog. What a neat study, the Fruit of the Spirit makes. I did similar studies with my kids and of course, it is always convicting to the mom. 🙂 Blessings! What a great illustration of gentleness! I’ll have to remember that one… I’m a mom of 2 toddlers and I love finding toddler-friendly illustrations. Stopping by from WLW.